How much will my home loan repayments be? And how long does it take to repay my mortgage? 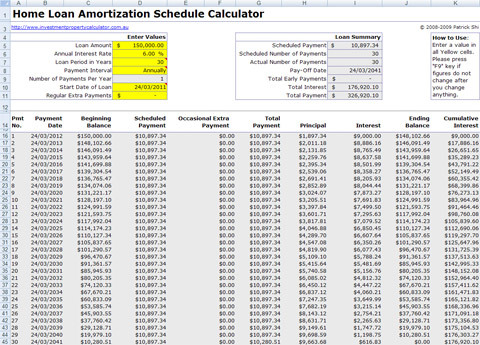 If you have asked yourself these questions, you can use this FREE home loan amortization calculator to create an mortgage amortization schedule and home loan payment schedule. Before you take a home loan (a mortgage), it will be helpful if you do a Loan Amortization and Loan Analysis using this FREE home loan amortization calculator. The calculator can provide you with all the numbers you need to compare rates and terms, review principle and interest payments, and do a "what-if" analysis. The calculator is based on the PMT function, one of Excel's Financial functions, which calculates a loan payment with a fixed interest rate and constant payments. You can do amortisation based on weekly payment, fortnightly payment (biweekly or bi-weekly) , semi-monthly payment, monthly payment, bi-monthly payment, quarterly payment, semi-annually payment, or annually payment by varying your loan terms from 1 to 30 years. Here is a screen shot that will give you a better idea that what you need to do and what this FREE home loan amortization calculator can tell you. It is a mortgage amortization schedule with annual payment. 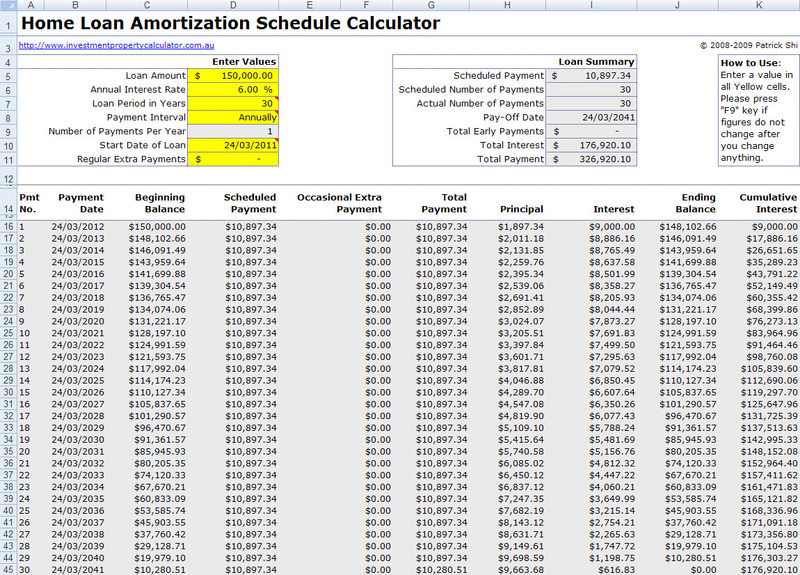 Download FREE Mortgage Home Loan Amortization Calculator Now! You can even use this calculator for your car loan, personal loan, bad credit loan, unsecured loan, student loan, payday loan, and cash loan or any loan you might want to have an amortization schedule. You might be interested with the Free Investment Property Calculator and the Free Mortgage Home Loan Repayments Calculator.